The story of XS186 has several chapters, but the story is not over. 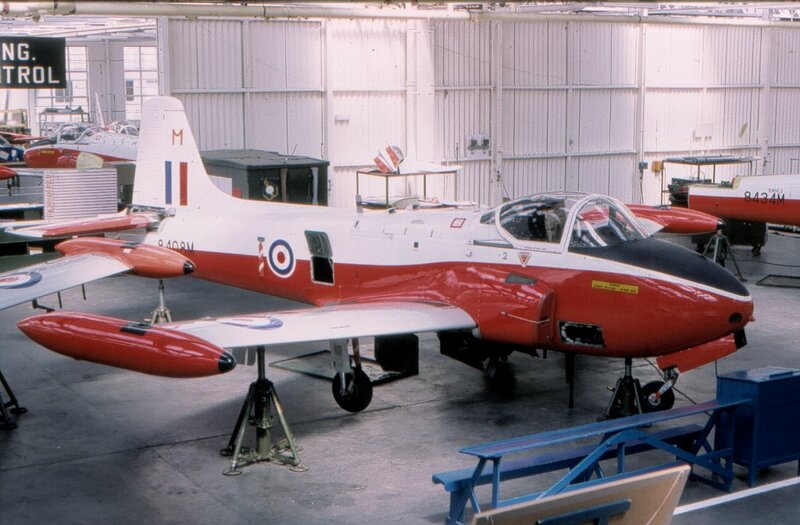 Jet Provost XS186 was delivered to the RAF on 18th February 1964. 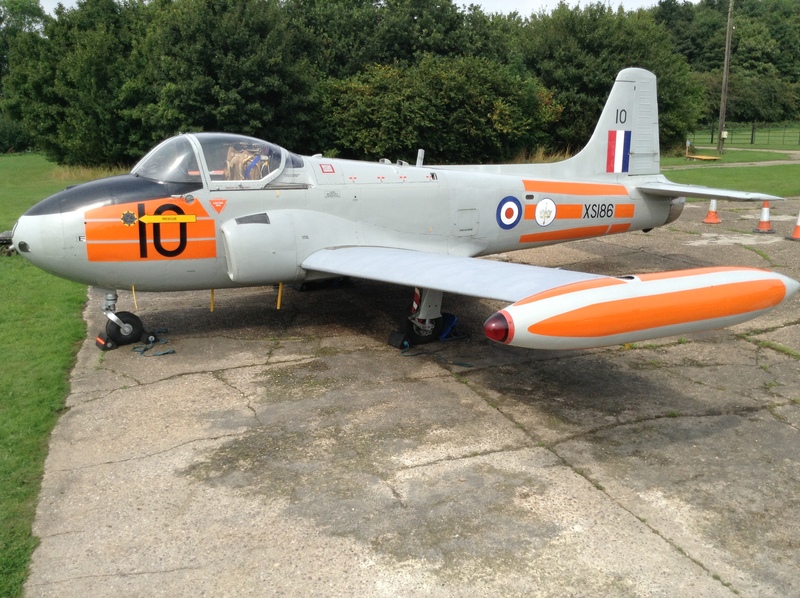 She arrived at RAF Manby in Lincolnshire with another Mk4 JP, XS209. 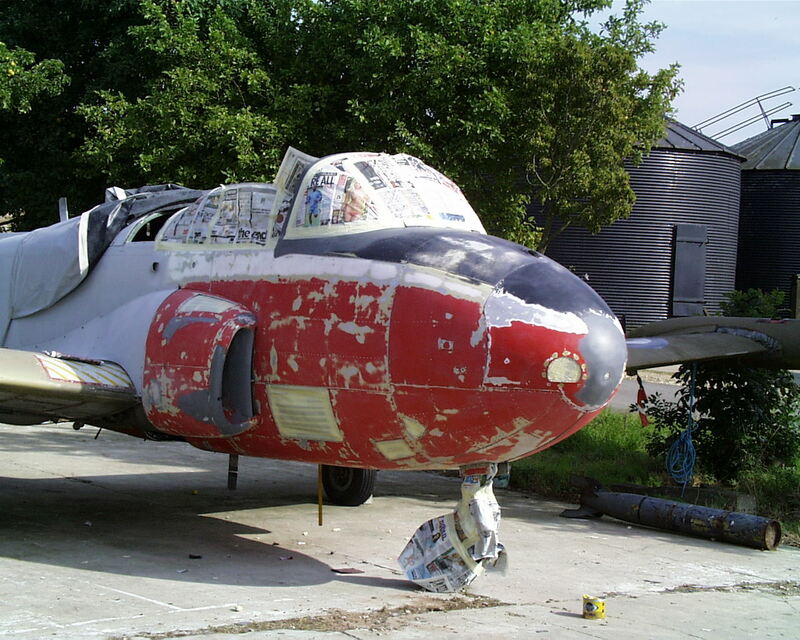 They were the first two ‘up-engined’ Mk4 versions of the Jet Provost to arrive at this, the home of the College of Air Warfare. Initially liveried in silver with dayglo bands and the nose and tail code ‘A’ , XS186 was put to work immediately, and given her very short service life, it is fair to assume that the RAF got their money’s worth. At some point in 1967 she adopted the short lived colour scheme of overall light aircraft grey, with dayglo bands and a new tail code of ’10’. More of what she got up to later, but just four years on from her first operational flight it was all over for this aeroplane, and she was grounded. What was clear was that despite the flying career of this aeroplane being very short, a mark had indeed been left. Don Soames-Waring was an RAF Jet Provost solo display pilot in 1966, and one of his two favourite aircraft was No.10 as he called her. Apparently there were only a handful of aircraft that could perform the high g manouveres he demanded, and XS186 or ’10’ was one of them. Suffice to say Don probably helped to make this aeroplane’s service life very short, but very sweet. Airshow displays were not uncommon for this seemingly desirable aircraft, and we know appearances were made at airshows as part of an early Jet Provost display team known as The Magistrates. She was also used as a solo display aircraft at RAF Leconfield and Coltishall respectively in 1966, RAF Finningley in 1967 and Woodford in 1968. Being chosen as the steed for an attempt at the Wright Jubilee Trophy in 1966 with Don Soames Waring once again at the helm, is worthy of note. It’s unlikely there were any tears when yet another individual JP took off for the last time from Manby, as there was a constant stream of JP replacements during the late 1960’s. Likewise her arrival at Shawbury in July 1968, Kemble in March 1973 and then onto St Athan in October 1974 for lengthy periods of storage would not have raised an eyebrow. The Mk4 Jet Provost fleet arrived at these locations en masse (the Mk4 exit from service was carried out at an unholy rate from 1968 onwards, due to the new found fatigue problems, which were undoubtedly caused by the high stress flying regime that the larger Viper 202 powerplant allowed), and for many it was not going to be a happy ending. XS186 was to stand idle at the above RAF stations up until around 1977, the only point worthy of note being that she, at some point during this period, gained the red grey and white colour scheme that became commonplace on all JPs from the late 60’s/early 70’s, even though she was no longer being flown. With so many Jet Provosts finding themselves on fire dumps or in scrapyards, one of just a few strokes of luck shone on No.10, and she was earmarked for ground instructional training at RAF Halton, adopting the maintenance code of 8408M. This move allowed her to be stored inside the apprentice training sheds there, and other than a few dropped wrenches and slipped screwdriver mishaps, this probably saved her from a rapid decline. Eventually her luck ran out, and No.10 was considered unfit for further training use. A truly savage period followed, as from 1992 to 2002 she was used by the Ordanance Disposal Unit at MOD North Luffenham for training bomb disposal techniques. This meant the planting of various ordanance on board the aircraft, with some very rough handling being handed out during the various wartime/terrorist scenarios. Indeed several years after her release from North Luffenham, two bombs, one of which was a 500Ib’er, were found in her engine bay, a legacy from those dark days (they have been kept for posterity). 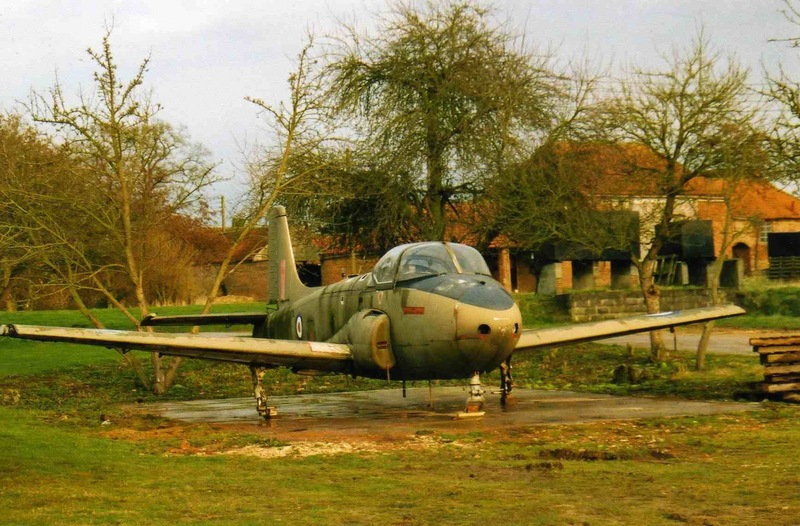 Around the year 2002 XS186 and several JP stablemates, all of whom had adopted a crudely applied olive drab scheme during their stay at North Luffenham (to mimic a more potent looking attack aircraft), were set for their final release from military service. 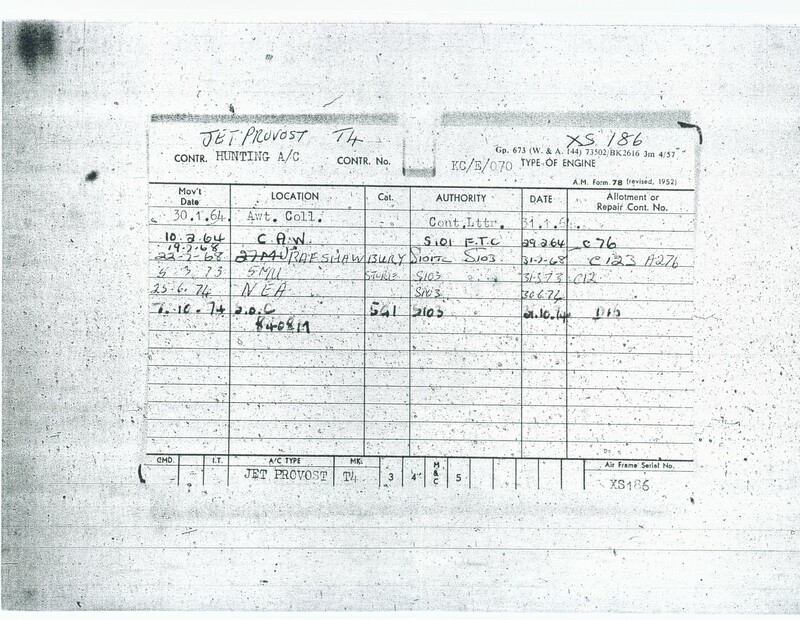 Six JP’s were bought by a well known military aircraft dealer, Everrett’s of Ipswich. But their purchase was a mistake. These could barely warrant the description of aircraft now, being stripped to bare airframes, with more than 90% of all their component parts being destroyed or removed. A far cry from the glory days of 1966. They were of no use to Everretts. The JP’s were dumped in a quiet corner of their storage yard and forgotten. In 2004 Paul Flynn was hunting for a project. On arrival at Everretts and seeing the JP’s there, something struck a chord. Might it be possible to make one reasonable museum exhibit, cosmetically at least? Of course it was worth a try, so XS186 was chosen as the one, for no other reason than her nosewheel leg was still pressurised, so it would be easier to stand her on her wheel-less undercarriage legs. There wasn’t much else that was good about any of these sad wrecks. With little fuss XS186 was put onto a low loader and transported to Metheringham, an ex WW2 bomber station in Lincolnshire. It was April 2004, exactly forty years since her journey began. The early months and years of work were extremely hard – but XS186 slowly takes shape…. Once settled at Metheringahm several very, very hard years of work was put in by Paul, Lynne, Ted and Greg, the founder members of the XS186 crew. Stripping the olive drab paint that appeared to have been applied with a shovel, lifting the two bombs from her engine bay, removing several inches of mud from inside the cockpit and fuselage, and freeing off seized up undercarriage and flying controls were just some of the early memories that were branded into the minds of this pioneering group. With such a daunting task the smallest of successes was hard fought for, but very rewarding. A special mind-set was formed that permeates to this day, with the newer crew members as well as the old timers. One that reflects the College of Air Warfares motto… Progress. Reflecting the motto in a rather more sombre style, several of the crew can often be heard mumbling “i won’t let an inanimate object beat me”. That’s the spirit! One could argue XS186 is a bit like the sweeping brush in Only Fools and Horses, in that so many parts have had to be replaced we often ponder how much of the original is still there! But the airframe is essentially original, although tailplane, tip tanks, most cockpit parts and almost all electrical and active system components are replacements. What is striking about XS186 now, is that she appears, feels, smells, and indeed is a ‘stock’ aeroplane, with no compromise being made on equipment not being original specification. 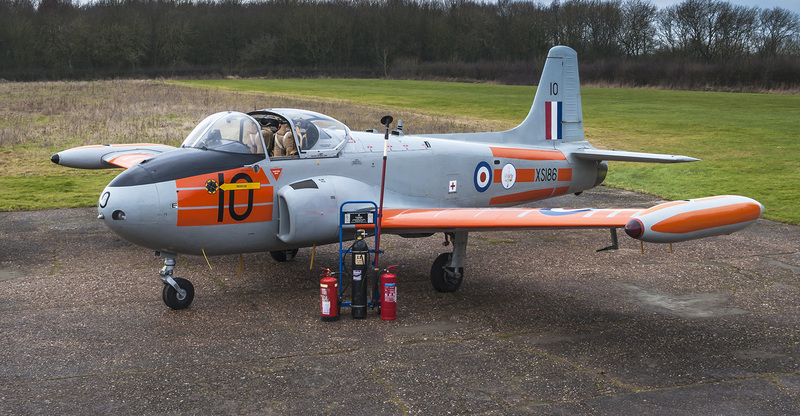 So, instrumentation, radios, engine and aircrew equipment are all what you would have found in a Jet Provost in 1966. OK, one slight caveat in the above claim is the powerplant in XS186. 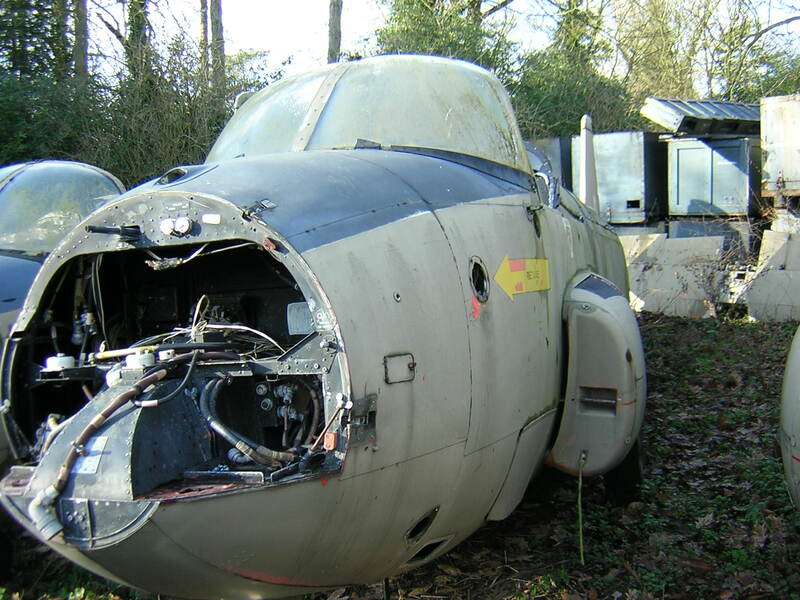 Originally the engine would have been a Mk202 Bristol Siddeley Viper. 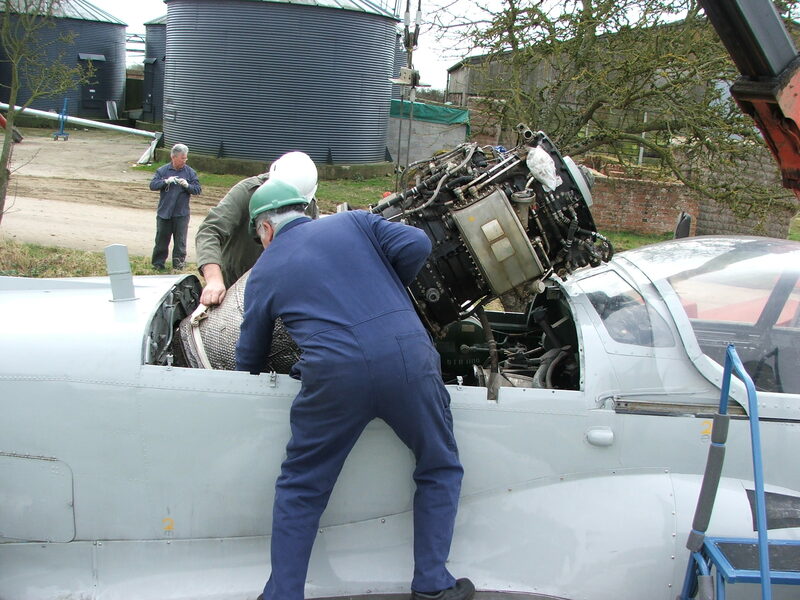 When we were searching for a suitable engine to re-fit into the bomb b……engine compartment, the best engine we could find was infact a Mk204, which although compatable with the Mk4 JP was a mystery as to why it had a different Mk designation. After some research it was deemed suitable for our aeroplane, so it was purchased and expertly shoe horned into place during 2009. Around this time a particulary interesting fact came to light, in that this engine is noted as being removed from a certain HRH Prince Charles aircraft in the 1970’s due to minor static vane damage. We are therefore quite proud that after all that No.10 has been through, she now proudly houses a royal engine! The Viper Mk204 is shoe horned nto position, with millimetres to spare! After many months of testing and tweaking our first engine runs were made during 2010 and 2011, and following a forced period of 9 months of dormancy, they resumed from June 2012, providing a massive boost to the crews pride and sense of achievement. Also in early 2012 the ejector seats were fitted making the cockpit 99% complete. This major milestone allowed taxy trials to start in September of that year, and the final top coating of the mainplanes was also carried out around this period. We also had new covers made to add to one initially produced for the cockpit and forward fuselage by a supplier, these subsequent one’s, for the rear fuselage, wings, tip tanks and undercarriage, made by one of our own crew members. These still protect XS186 to this day, not only from the natural weather elements but also the UV light which would bleach the now re-applied dayglo stripes and decals. 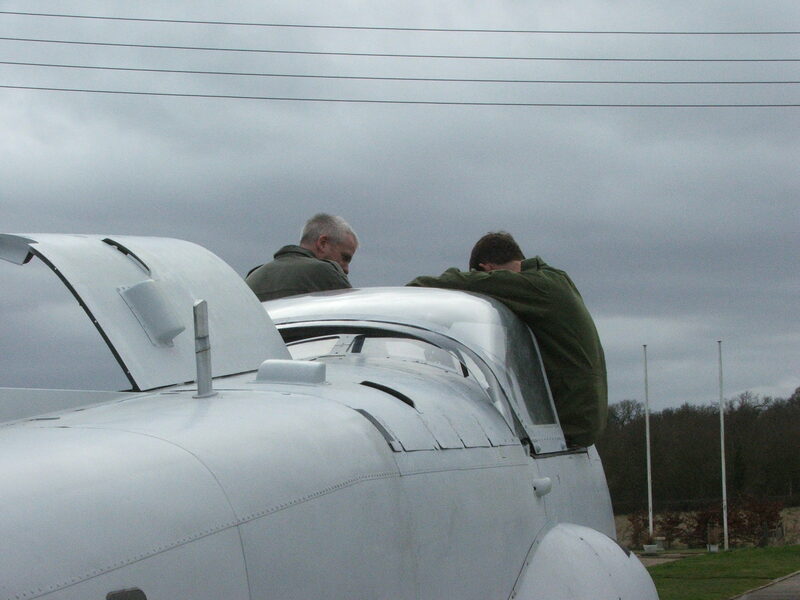 Much of 2013 was spent completing the dayglo stripes on the fuselage and tip tanks, and rectifying various technical issues that plagued operations for two thirds of the year, but despite this a good deal of progress was made, with the crew obtaining and restoring a cabin for their own use, and several new crew members joining to share the still heavy workload. 2014 saw almost all of the remaining cosmetic work completed on XS186, with the starboard wing underside renovated and all but re-painted, and the huge undertaking of applying dayglo scheme to the upper mainplanes started and finished over the course of several extremely hard days. The weather held it’s end of the bargain too! 2015 saw XS186’s restoration and ongoing operation more widely recognised than at any time since the project to rebuild her began. An increased number of public events, recognition in several publications and the widening of partnerships with like-minded organisations all helped us to promote our passion, keeping XS186 operational. Inevitably this slowed some of our restoration work, but it didn’t stop us, and the complete renovation of our aircraft tug (Terry), and a runway caravan to support operations and cater for the public as educational aids, all came to fruition. As a consequence of widening public interest, 2016 will be another very busy year, with still outstanding cosmetic work to complete on the main plane undersides, the huge under-taking of an undercarriage strip / re-build and testing to start in the Spring. All of this is now being supplanted by what we consider something of a well earned ‘spotlight’ being shone on XS186 at numerous planned events. Glad to see a JP coming back to life not many Mk4 left. I worked on the Mk3’s and Mk5’s on the line at Linton. Hard work but some fun with the lads. Well done to everyone involved – a great read and a good start to the day. 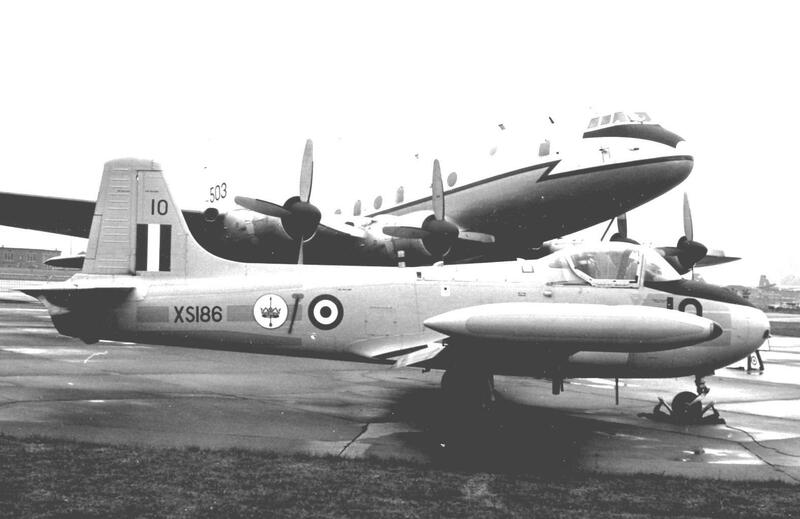 Steve Jones ex T4’s at Finningley and T3 & T5’s Cranwell. I came across your story by chance, but found the saga of XS186 fascinating. Well done to all concerned. I flew JP3s and 4s in pilot training at Leeming in ’64, and flew one JP4 at Manby once in March ’69 while on a course at the CAW – not 186, but “Fleet 22” (serial not noted).